The Xtar Six-U is an intelligent USB charger that is cable of charging 6 devices at once. It eliminates the need for multiple plugs sockets, making it easier for the whole family to charge their devices all at once. The ports also offer faster charging that most regular chargers, with each port capable of delivering up to 2.4 A. The Six-U makes an ideal travel companion as you can take just the one travel adaptor with you and still be able to charge multiple devices, which is handy in hotel rooms with limited plug sockets. You can safely charge your devices as the Six-U has over voltage, over current and short circuit protection as well as premium circuitry and is made from flame retardant material. Each port is compatible with a huge range of devices such as smartphones, tablets, E-cigs, electronic watches, USB battery chargers, MP3/MP4 and more. 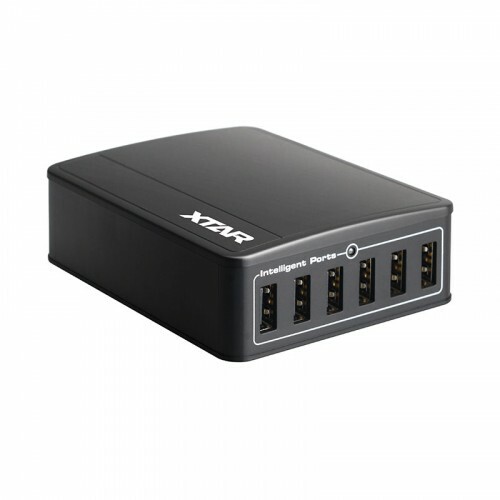 Note: The combined maximum output for all ports is 9 A, therefore when all six are in use the maximum output could be reduced to 1.5 Amps per port depending on the devices being charged.